Bible Teacher and Author, Tony Cooke has been married to his wife, Lisa, since 1979. Together, they have been serving the Body of Christ since 1980. Since 2002, Tony and Lisa have traveled full-time with an assignment of “Strengthening Churches and Leaders.” Tony’s passion for teaching the Bible has taken him to forty-seven states (US) and thirty nations. The website of Tony Cooke Ministries has reached 2.7 million unique individuals, many of them pastors, missionaries, and other church leaders with encouraging and helpful ministerial resources. 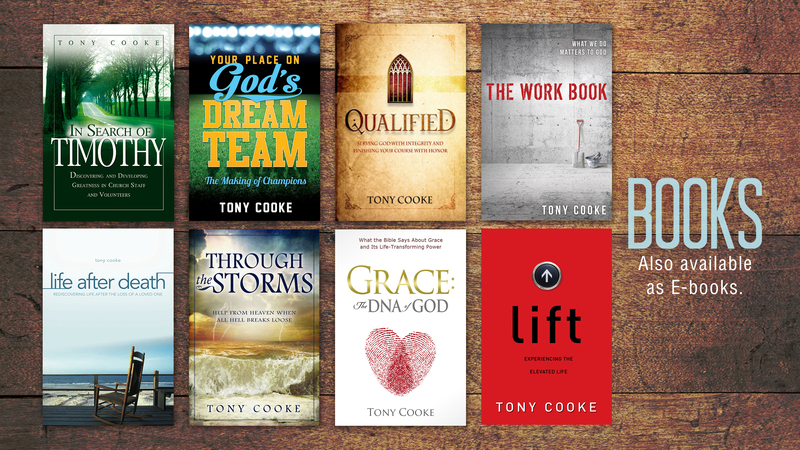 Books authored by Tony include: Life After Death, In Search of Timothy, Grace: the DNA of God, Qualified, Through the Storms, and Lift: Experiencing the Elevated Life. Various titles have been translated and published in eight other languages. Prior to traveling, Tony was involved in pastoral ministry for more than twenty years, and served as an Instructor and the Dean of Rhema Bible Training Center. He also served for thirteen years as the Director of an International Ministerial Association. In addition to being a 1981 graduate of RHEMA Bible Training Center, Tony studied Religion at Butler University, and received degrees from North Central University (Bachelor’s in Church Ministries) and from Liberty University (Masters in Theological Studies/Church History).